First up in our Whisky Ladies of Mumbai‘s ‘European Tour‘ was a Finnish whisky. Introduced as coming from one of the smallest pot distilleries of the world, Teerenpeli Distillery is based in Lahti, Finland. The family owned distillery opened in 2002, uses Finnish barley, and have played around with maturing their whiskies in ex-sherry, bourbon, port wine and rum casks. For the Teerenpeli 10 year, they indicate it was matured in ex bourbon and sherry casks with an 80/20 ratio, first launched in October 2015. Water – Absolutely no need! It was a perfect whisky to kick off our European tour. Immediate exclamations of “Divine!” While only 43%, it delivered more than your typical 40 – 43% strength. A few initially found the dichotomy between the nose which brought to mind scampering along a meadow with spring-like perfume vs the smokey, highly oily palate a bit disconcerting. For most this was the very element that brought such enjoyment as it it pulled off that amazing balance between being quite ladylike yet with substance. I sampled it again a few days later with one of our whisky ladies who could not join our original session and found I enjoyed it even more. Simply one of those whiskies you greedily want to sip and savour all to yourself! Alas, as it was a 50 cl bottle, a favourite of several whisky ladies and was brought out for a 2nd evening, the Teerenpeli is no more! Clearly a hit and I would both recommend others snag a bottle of this if you can and will myself keep an eye out for more offerings from Teerenpeli! Warning – it may be a wee bit difficult to track down outside of Finland and Sweden, with the exception of the Whisky Exchange and Master of Malt. 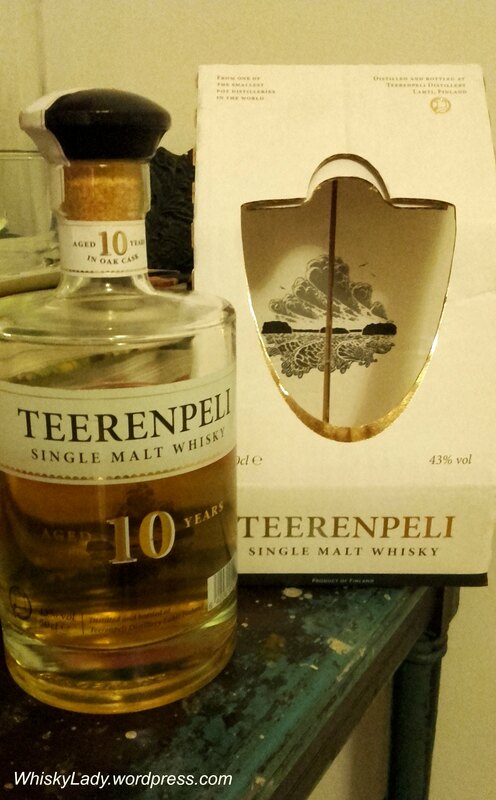 This entry was posted in Beyond Scotland, European, Finland and tagged Finnish whisky, Peat, Teerenpeli, Teerenpeli 10 year 43%, The Whisky Exchange by Carissa Hickling. Bookmark the permalink.